This table is long overdue in my shop. 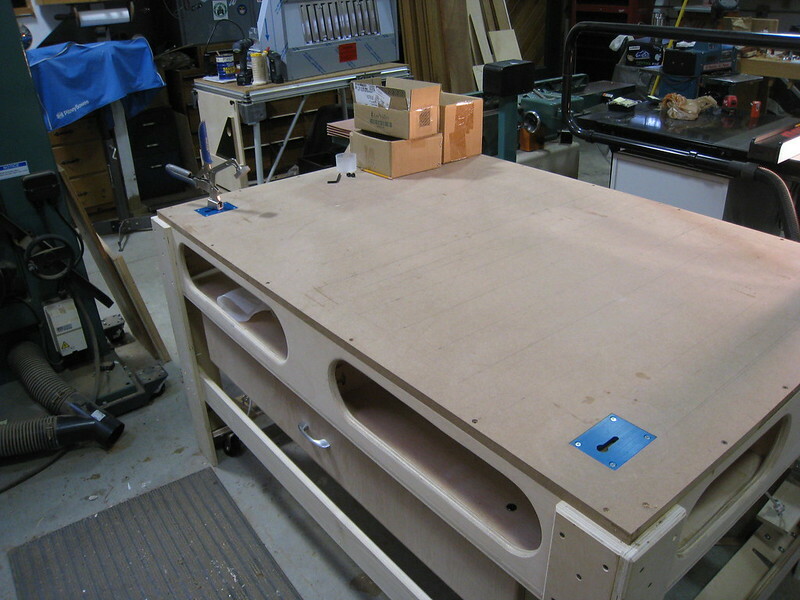 It serves as both an assembly table and an out-feed table for my tablesaw. Sadly I didn't take pictures of my old setup. It was a 1/2" 5'x5' piece of baltic birch plywood set on top of a sort of sawhorse gig. Here's a picture of it from my Roubo build. It served me for over 25 yrs. and I hated every minute of it. It was rickety and, like most horizontal surfaces in my shop, gathered piles of junk. I liked the idea of a Paulk bench. I can toss clamps, drills, etc. underneath during assembly, and if I need to rip a long piece through my tablesaw, I only need to slide whatever I'm working on to the other side of the table. All the tools and glue are conveniently tucked out of the way. I've also always admired Norm Abram's assembly table with the mobile casters. I didn't have his plans, but I gleaned what I could off of this Youtube video and just winged the dimensions. It works GREAT! It's genius. Although I don't have much room around it to move it, the drawer that I added makes it very heavy so the casters are helpful when I want to sweep underneath it. ....Oh yeah, the drawer. I do a fair amount of picture framing and the mat scraps are always littered around my shop. 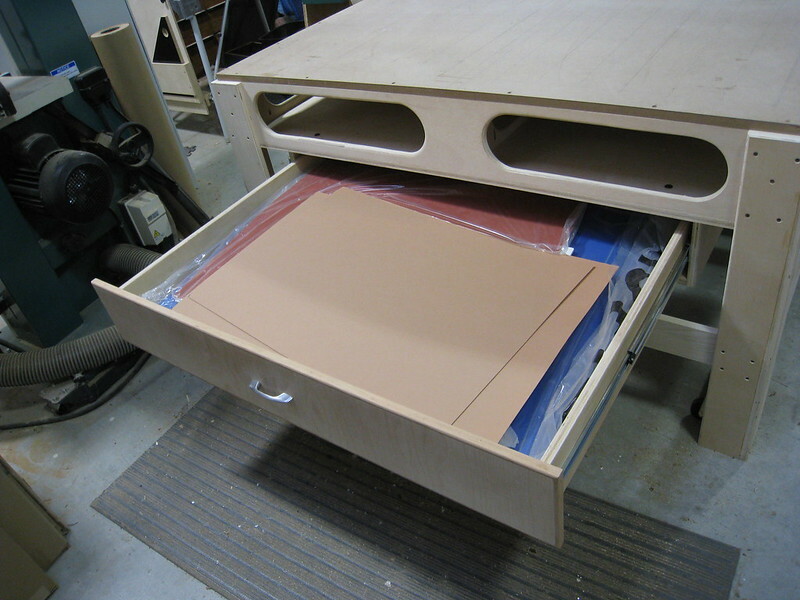 I built this drawer assembly to contain them and keep them dust free. 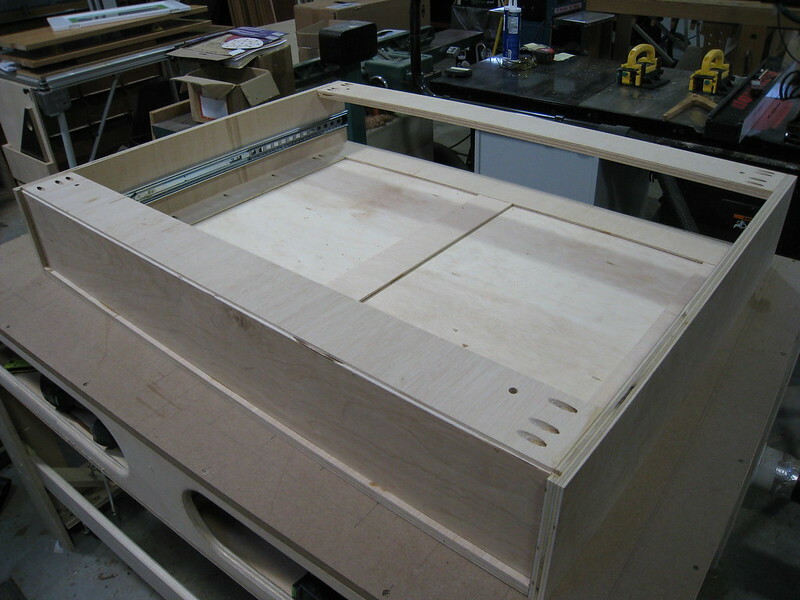 The drawer itself is heavy, it's made with 3/4" birch ply sides and 1/2" bb bottom. It's also the largest drawer I've ever built. It measures 35 x 44"! I wanted to keep the weight of the carcass to a minimum, but it also has to be air tight to keep the dust out. 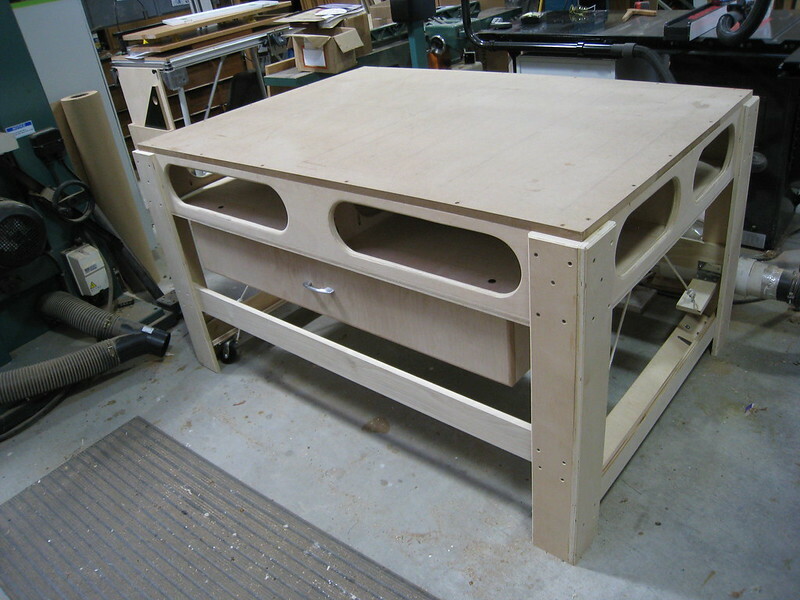 I used 3/4" birch ply for the sides for stability, and a lightweight frame and panel for the bottom. 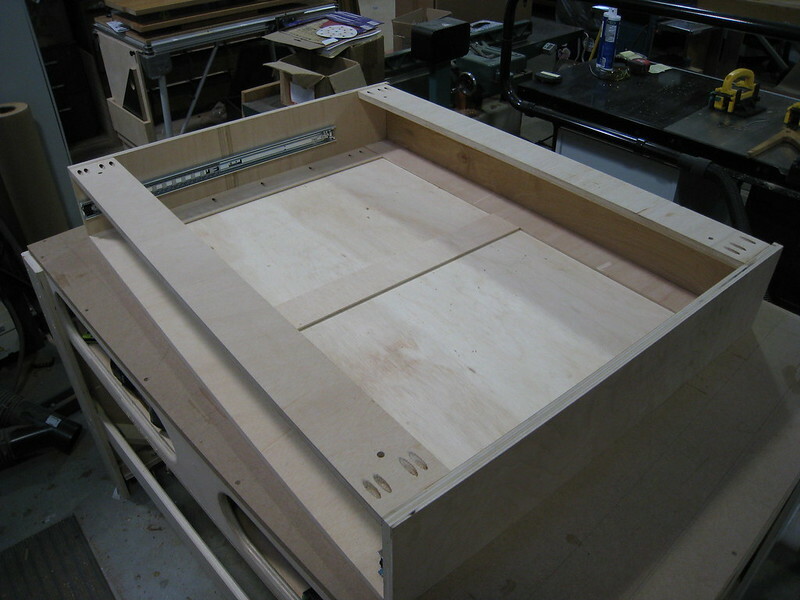 Here's a picture of the drawer front trim clamped on. I used a piece of 3/4" birch ply and wrapped 1/4" cherry trim around it. 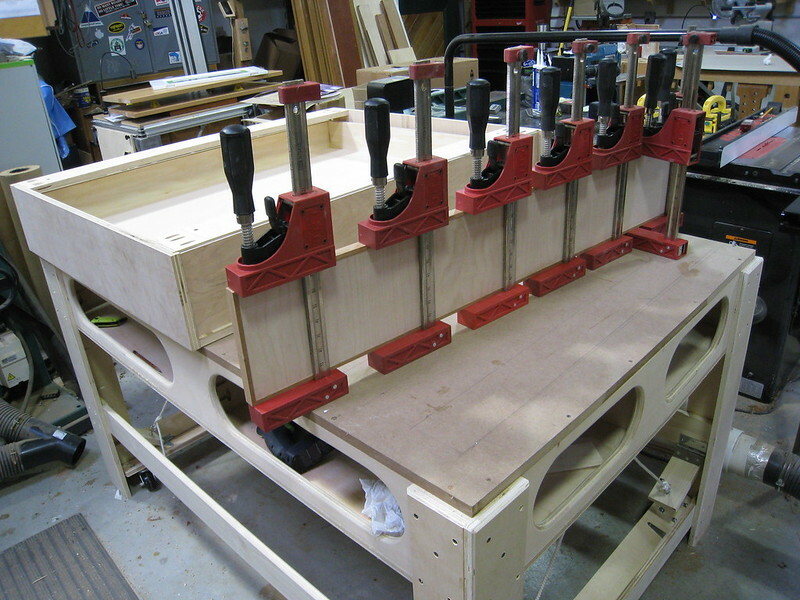 Gotta love my 24" parallel clamps! I'm going to drill some 20mm holes in the top for clamping, but not too many. I have and MFT if I need it. Fun project and it will be sure to make life a little easier and a whole lot faster in my shop. Nice ! Looks very rigid yet comparatively light weight. That is one BIG drawer. Those Jet clamps are wonderful. 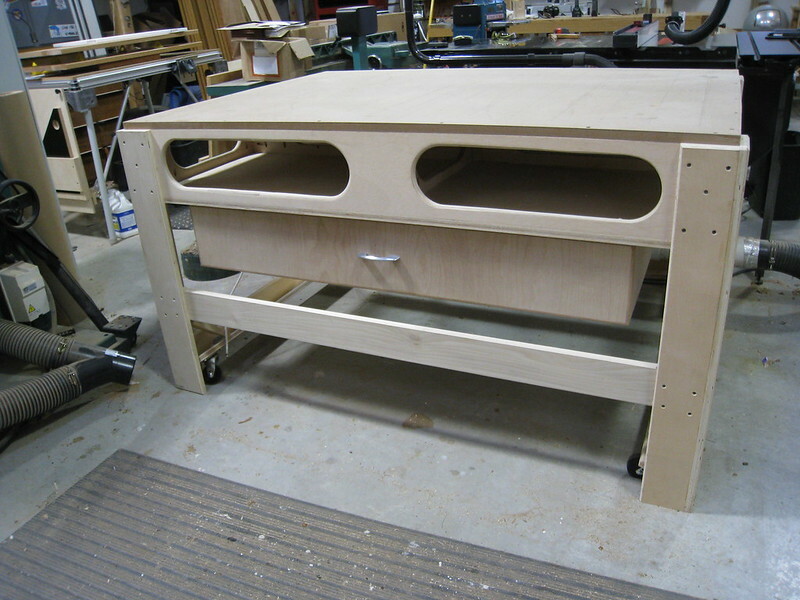 I remember watching norm build his assembly table and the caster idea is simple and works great for that type of table. That is going to be one useful table. How about revealing the secret of the casters? Don’t you have a pair of BowClamps? Thanks guys! Michael, check out the above Youtube video above for the caster reveal. They work great and I'm already thinking about future projects I can use them. And...I do in fact have 3 sets of Bowclamps but rarely use them. I find they just don't produce enough clamping pressure for my eye. 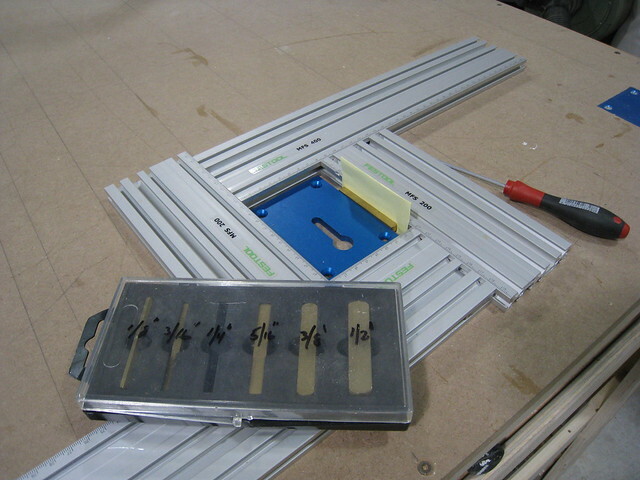 I use them occasionally as cauls to keep a panel assembly flat while I glue them together. I had forgotten about this New Yankee episode until you reminded me through this post- Thank You for sharing! I like how you have taken two great ideas, combined them, and then added your own touches to it. 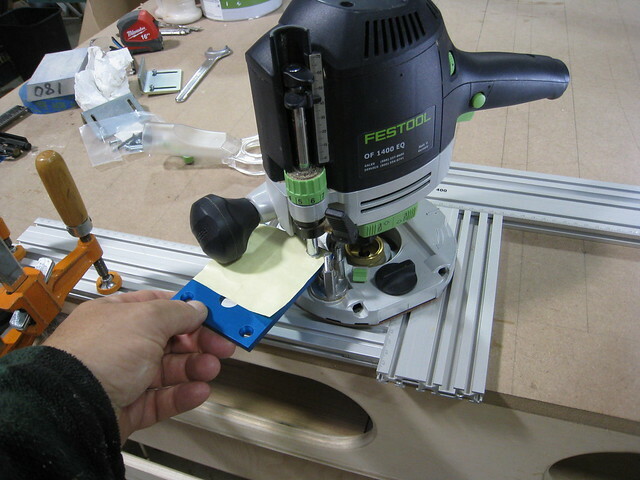 I too have been pondering the best solution for an assembly/out-feed table, and yours looks the closest to what will work for me. One change that would make more sense for my application would be to have a shelf below vs the drawer so I could store a sled, rip fence, or other items. 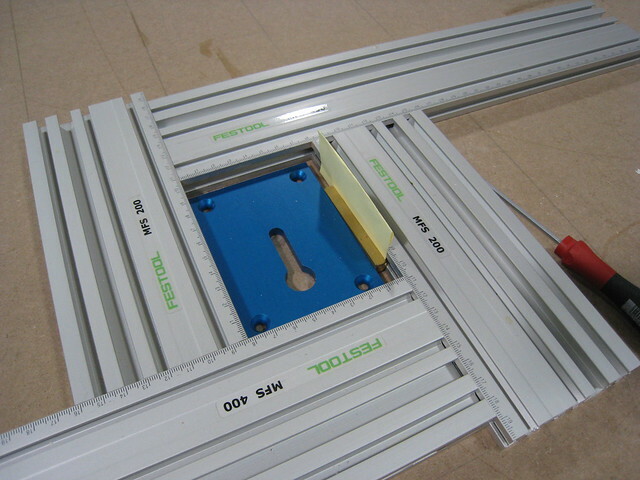 Perhaps some smaller drawers for blades, wrenches, assembly supplies, etc. but I totally understand you wanting the large drawer and I'm sure it's working great for you. Great job and Thanks much for the inspiration! 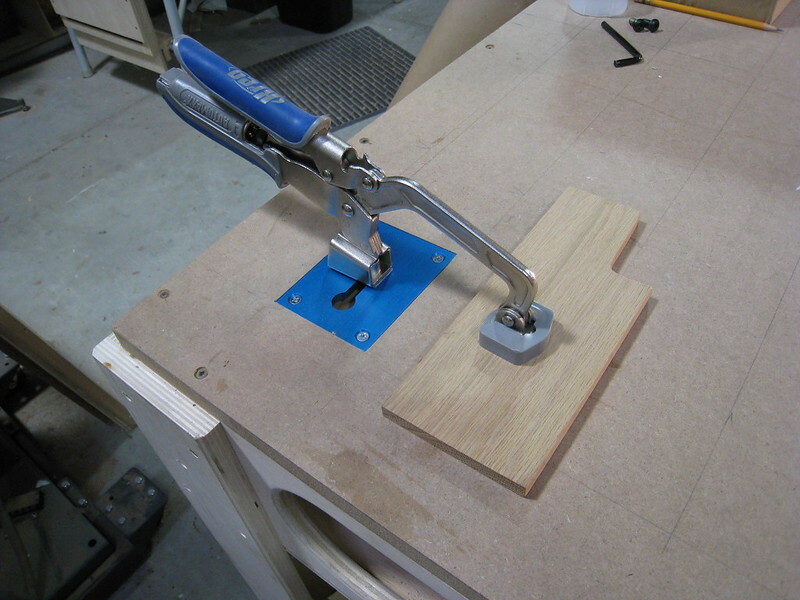 I added a couple of Kreg bench clamp plates to my table, 1 at either end. It'll come in handy when screwing together face frames. I'm thinking I might not even need to drill clamp holes and that will mean no hanging up on the holes when ripping long pieces on my table saw. 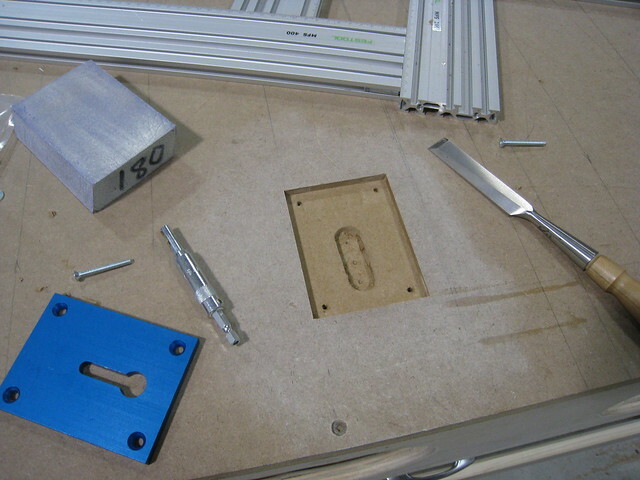 I used my MFS and my OF1400 router with a 1/2" collet to mortise the rectangular insets. What??? No 20mm holes on 96mm centers??? Blasphemy!!! A grid of holes can be useful but a grid for grid’s sake...? 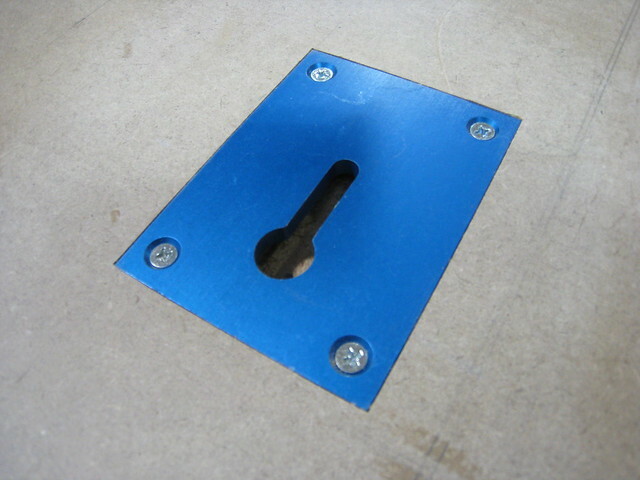 With a 20mm bit he can add a clamp hole wherever and whenever he needs one. 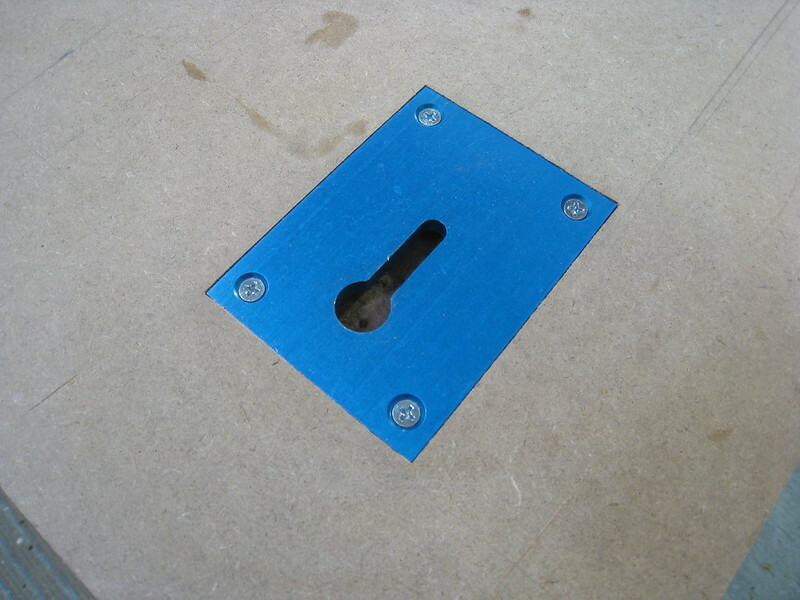 After putting together some face frames I decided I could use another Kreg Clamp Plate in the middle of the table. 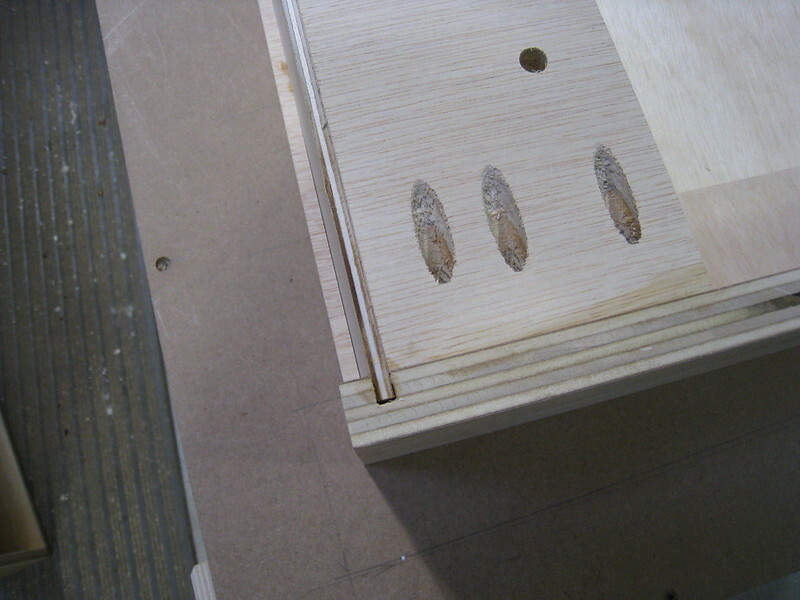 I forgot to photograph my process of routing the mortises the first time around so here goes. It's very easy to do for those of us in the US who are lucky enough to own an MFS template. 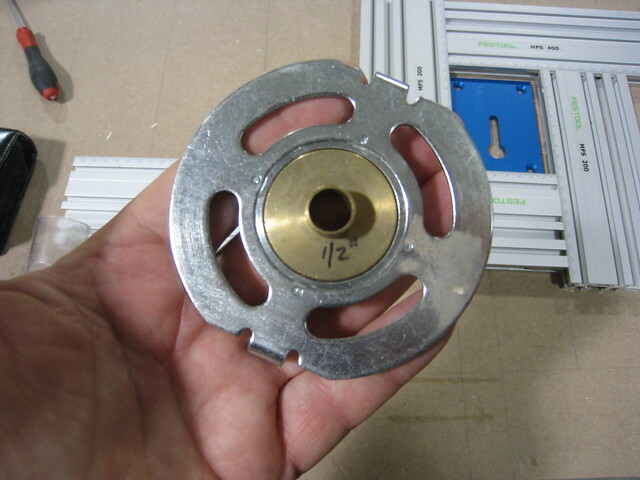 I start with my OF1400 router with a 1/2" guide bushing. Since I'm using a 1/4" spiral mortising bit, I use an 1/8" setup block with a post-it note folded in half for some clearance. After I've routed it out, I square up the corners with a chisel, test fit the plate and just following instructions, trace out the keyhole and drill 3 ea 3/4" holes with a forstner bit for clearance for the bolt on the Kreg clamp. The MFS sure does do a nice job, and it was easy and clean too. Sorry to see it NAINA. 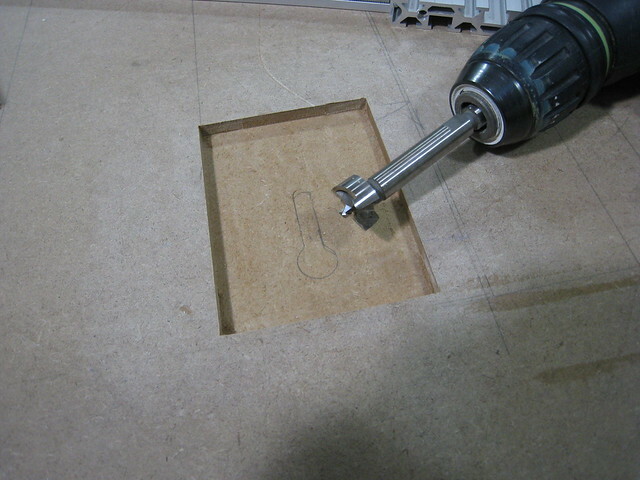 The Kreg clamp is great too. 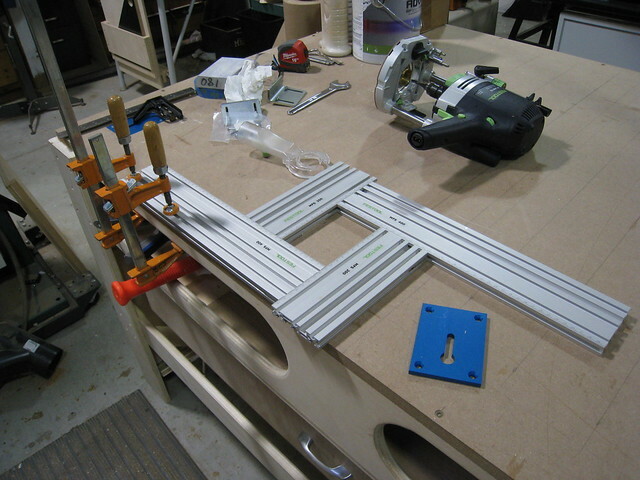 So much harder screwing together face frames on the MFT with Festool clamps. I wish I did this a lot sooner!